Admit it. Your closet is just full as everyone else’s. Hidden away in the dark, dusty corners lurk row upon row of skeletons, lined up, waiting to jump out and frighten anybody who takes a look inside. Of course these aren’t literal skeletons. 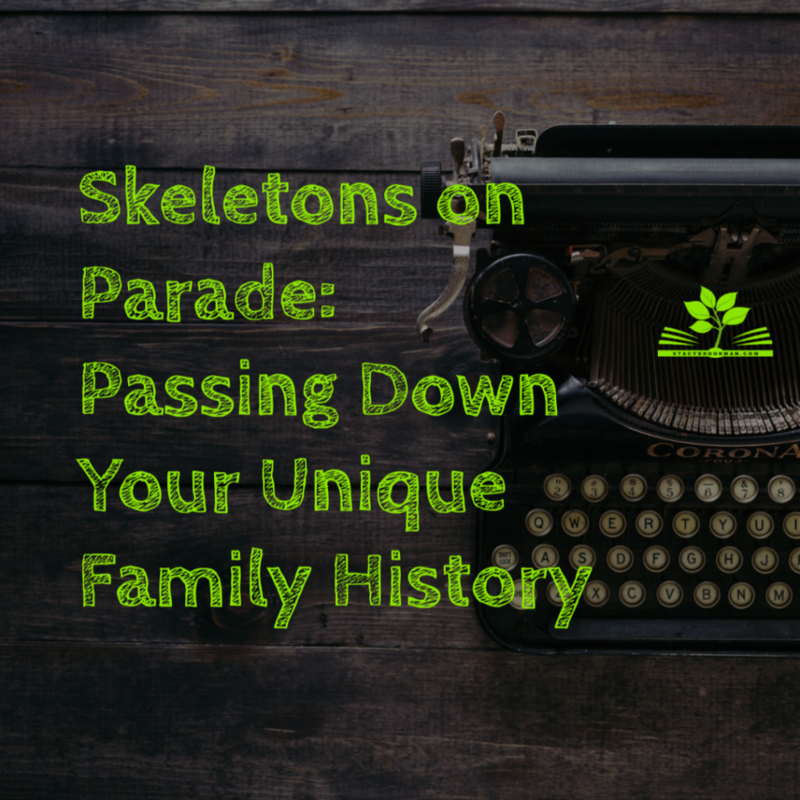 I’m talking about the “skeletons” we keep in our “closets” – those secret family stories from past generations and even our own regrets hidden away. We try to forget about them, but that’s usually impossible. In the end, we’re the ones who feel frightened, lonely, and sad. You might know and love the family member who is the cause for these intensely personal and sometimes scary stories, or it might have been someone whose actions several generations ago are still spoken about in hushed tones. When you consider that your life story is made up of the life stories from all of your ancestors, though, you’ll find that opening the door and shining the light on these skeletons helps you uncover and address the tough times in your own life. It also helps you pass down some learned wisdom to help future generations. Which Skeletons Are in Your Closet? Many people of German ancestry have found some level of family connection to the Holocaust. Teege’s, though, is spelled out in her memoir, “My Grandfather Would Have Shot Me.” She was adopted as a child, but wanted to learn about her history. Her father was Nigerian and her mother was the daughter of Amon Goeth, the real-life antagonist in the movie Schindler’s List. She wasn’t told by her family members. She found out one day at the library. What follows is her story of learning about and healing from a history she never knew. Teege tells about the psychological, emotional, and mental challenge of reconciling the grandmother she loved with her grandmother’s love for a mass murderer. Of the woman who loved her granddaughter, knowing that the man she loved would have shot the child for being black, even though she was part of the family. She pulled out the skeletons, looked at each person involved as one of the bones holding her family’s history together, analyzed it, and came to peace with it. Perhaps finding your family’s history won’t be as dramatic. After all, it was a seemingly random, chance incident that led her to find out where she came from. But as many can attest, even just a glimpse of the skeleton’s pinkie toe can be enough to send you on a journey you’d never expected. Finding your family’s skeletons can be a challenge, but Evan Imber-Black, a long-time family therapist, says that they always have a tendency to come out. “Every secret is like a member of a family, reflecting familiar patterns handed down generation after generation, while simultaneously embodying its own unique soul,” he says. He notes that each person “who decides to wrestle with a particular secret faces a special set of circumstances that they’ve never experienced.” Much of this starts from the minute you find the secret. Some people are raised knowing a family secret that can’t be shared. They are told at young ages about something that occurred — or may still be happening — that directly affects the lives of members of the family. They’re instructed to keep the incident quiet, so that no one ever knows what happened. You might feel trapped, burdened, guilty, and scared under such weight. Other individuals discover family skeletons by accident, like my friend, or Teege. One sentence, a book cover, a news article that leaves you thinking — each of these can be enough to pique your curiosity and send you looking for more information. What you find can leave you feeling sucker-punched, shocked, and at a loss for words. In one instance, Imber-Black writes about an Austrian woman who came to see him after a life of wishing she could be American. She wanted to learn English as early as she could, spent her time consuming American books and music, and saw the cold, bitter responses from her parents. When she was 38, she overheard a fight between her parents that revealed she was born out of an affair between her mother and an American soldier. She told Imber-Black that she felt she had to rethink her entire life. Finding skeletons like this, unexpectedly or by overhearing a conversation, can leave you wondering who you are. You might feel some relief by learning more about what your family has gone through and explanations for the more challenging periods of your life, but you may also feel lost and confused. There are times when the secret-holder shares the skeleton with you, out of the blue, or in a moment of confession. Maybe you’re visiting, or you get a phone call, and someone tells you something you’d never expect. These can leave you hurt, betrayed, and angry. Start talking to your family members, especially if you have questions about your life and your history. Don’t be scared to ask questions, even if family members seem reluctant to share. Research your family genealogy, look for clues, and read old family journals, Bibles, and diaries. Take notes and look for connections between different stories family members have told you. You’ll find that each story and sentence leads you to another, until the separate pieces and parts form the entire skeleton connect, painting the true picture. After you’ve done your own research and processed some of your findings, you will most likely find yourself at a crossroads. Do you continue to keep the family secret, or, like Teege, do you make the hard choice to share your story with the world? Telling others about the darkest or most unflattering times in your family can be terrifying. The truth is, preparing to tell others is actually the scariest part. You wonder what people will think. You worry they’ll judge you. A million thoughts go through your mind, and soon you give in to the skeletons, and you hide them back in the closet, among your guilt and fears. These are toxic feelings that keep you imprisoned by your own secrets. Healing in your own life often comes from your need to address the skeletons in your family’s closet. When you let the skeletons have their way, you find yourself in a worse situation than you did before. The old saying goes “ignorance is bliss” and when you didn’t know about the skeletons and stories, you may have felt something was off, but couldn’t put your finger on it. It was easier to live your life because the skeleton wasn’t standing right in front of you. If you want to move forward, though, you need to move that skeleton — and sharing your story can be the ticket that helps you give the skeleton, and the story it brings, a proper funeral. You’ll learn to cope and find peace in the story. At the same time, when you actually do share your stories, you’ll be amazed at how many people can relate. They haven’t lived their lives the same way you have lived yours, but they know the struggles, and they will be thankful you’ve passed on what you’ve learned. The end result is a beautiful sense of relief because you’ve let the skeletons out, and you’ve recorded something important about your family. You’ll also be giving other family members a precious gift: the answers to the questions that may have unsettled them for so long, too. You might not be the only person in your family to have the same feeling, hunch, or snippet of information. Even if you don’t share your story with the public, putting it in writing for your family to read can help others learn about — and heal from — the same incident that is causing them stress. Many of us consider writing our memoirs or family stories at some point. It’s a wonderful idea. But why should we be restricted to the happy times only? Think of your favorite books or movies. They are compelling because they include times of conflict. Heroes make mistakes. Bad things happen. People throughout history have experienced loss, heartache, trials, and tribulations. 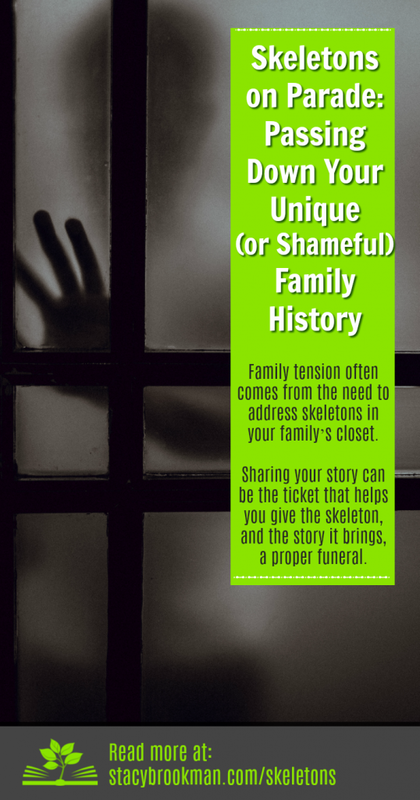 Telling that story makes your family and story more relatable, because everyone has gone through something hard in their own lives; even if their skeletons are vastly different, they are still trying to pull their owners into the secrecy of the closet. Open the door. Shine the light on your skeletons. The message of hope comes only after the characters face true struggles. Your family has found its message of hope in a unique and interesting way. Honor that message by writing it down and accepting the struggles for what they were. You’ll show people that they, too, can conquer their fears and their family’s past. You’ll show the power of forgiveness and faith. You’ll show people that families can grow together come out of challenges stronger than before. What will happen to the skeletons? They’ll get out. They’ll climb out of the closet, dust themselves off, look up at the sun, and go on parade. That may sound horrifying if you’ve kept them locked away for years, but it will feel amazing when it happens. It’s cause for celebration — your family has learned to overcome. The goal is to own your darker times. Respect your family history – the good times and the bad. Wear your mistakes like badges of honor. March down the street with your skeletons, proud of who you have become. You can start small. Do some writing exercises to practice what it feels like to admit your skeletons are real. You might pick a story that’s only a little painful, or you might choose one that many people know already because it happened recently. Try to frame this story in a positive light. Don’t pretend it wasn’t hard; instead, accept all the hardships of it, and then show the lessons you’ve learned and how you moved on. White about what you felt, who was involved, how you learned about the story, and how you handled the story. Include the truth, even if it might hurt, because that will help you develop strength and prepare you for more challenging stories. This is an extremely healthy exercise. Even if you never show this story to a single person, the act of writing it down can help shape your thoughts and strengthen your resolve to be happy. When you’re ready, try another. Start to dig into the closet by researching your family’s history, asking questions, and following the trails and hints you’ve gathered. Let those skeletons out. Go on parade!